A phrase made popular by the beloved Caroline Hirons, “acid toning” has a place in every skincare routine — but especially in a combination / oily girl’s skincare routine. For my personal skincare ritual, I reserve acid toning for evenings only, and prefer to indulge in it every other night to keep my skin bright and happy. During especially stressful times — or during that time of the month — I opt to acid tone a bit more often to keep my skin in check while I deal with hormonal ups and downs. While I’m still experimenting with many acid toners, I’ve found some success and some duds in the following. And please do remember: Acid toners aren’t always the cleanest, but they are effective. I’ve chosen the cleanest I could find, but everyone’s definition is different. Do your own research! Avanti RX’s Essential Exfoliating Pads are gentle enough to use every night if your skin is very oily like mine and accustomed to acids. The pads themselves are not as soft as others I have tried, though. That’s really my only critique of these pads, as the ingredients list is quite clean and loaded with the best acids available for modern skincare. I’d be quick to repurchase and recommend these pads if the texture of the pads were softer, but they’re still a great buy even if they are not the softest. Highly regarded as a cult acid toner, Biologique Recherche’s Lotion P50 lives up to the hype. I chose to try P50W 1970 because it’s targeted at dry, mature skin. But wait … isn’t that the opposite of you, oily, youngish Kim? Yes, but because this was my first experience with Lotion P50, I wanted to get something mild. As a newb to Lotion P50, I was a little in over my head with the different choices (there are SIX VERSIONS). I went with this mild version (as denoted by the W?) and the original 1970 formula, which contains phenol, which is by no means natural, because I wanted to see what the fuss was about. And now I get it. And I’m intrigued by the non-phenol versions, which are rumored to be even better (and a little more natural?) than the 1970 version. My next bottle will be a non-phenol version, with hopes that it performs just as well! I’ve seen remarkable difference in my skin’s texture and breakouts while using P50. UPDATED: I much prefer the non-phenol Lotion P50! Smells like vinegar instead of chloraseptic and works just fine! I also did NOT experience the famous burning / redness that many speak of (maybe because I got the gentle version), so it’s been an overall positive experience. While it is true that yes, this stuff stinks (smells like vinegar and chloraseptic spray), it works … and that’s all that matters if the ingredients list works for you! A twice-weekly treatment, Kate Somerville’s Clinic To Go Pads gently resurface the skin via the power of lactic acid while calming and cooling with myrtle and sage leaf extracts. 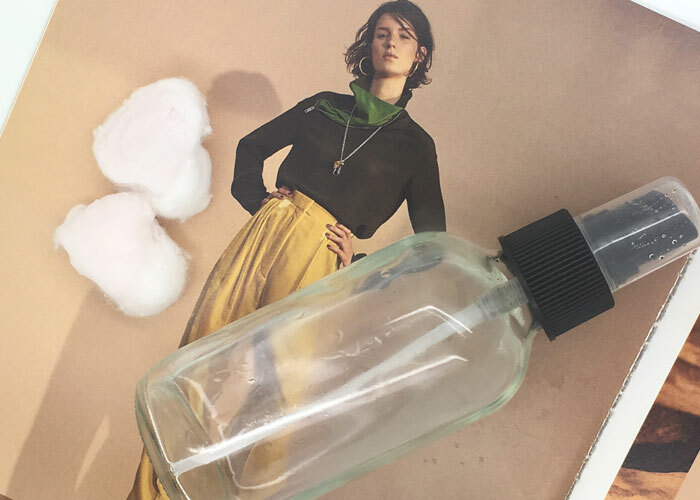 The smart packaging — individually wrapped pads that you place atop two fingers — makes this acid toner my favorite for travel. While on the expensive side, you truly only need Clinic To Go twice a week, which gives you a full month’s supply for $52. Each individually wrapped towelette (it’s something like a 3-inch square) is soaked in a cocktail of glycolic acid, witch hazel, salicylic acid, peppermint and lavender to take on breakouts and deep clean pores, visibly reducing the appearance of pores and improving tone, texture and clarity. My boyfriend commented on how clear my skin had been looking (he, too, suffered from acne in his teens so understands my struggle) after using these regularly . When someone else notices, you know it’s real! These aren’t pads for sensitive skin types, and I only used them on my chin and jaw. I couldn’t imagine swiping them across my combination skin cheeks. It’s this strong formula that makes me call Rhonda Allison’s All Purpose Cleansing Pads almost perfect. I’d buy them again in a heartbeat because they did seem to work at killing the hormonal and funky acne on my neck and chin, but I’m still hunting for a formula that feels just right. I wanted to love this. As an acne-prone girl in her 30s, I really, really wanted to love this. Dr. Dennis Gross’ One Step Acne Eliminating Pads are loaded with 2% salicylic acid (#legit!) to tackle truly acne-prone skin. Only problem was, well … these pads were way too strong for me. After using them only on my chin and neck areas, where I tend to break out the most, I was left with very itchy, irritated skin. I used these every other night, and then every third night, and my face just could not tolerate the formula. It didn’t do anything for my very visible, red, angry acne (besides irritate it more). Steer clear of these unless you’ve (literally) got thick skin. This is a strange one for me, so please follow along. Pixi Glow Tonic is not a repurchase for me, but I’d definitely recommend it to someone very new to acids who has sensitive skin. Here’s why: It’s formulated with a very gentle 5% glycolic acid and topped with soothing aloe, ginseng and other botanical extracts to ensure the skin isn’t overly acid-i-fied. This is an extremely gentle acid toner designed for all skin types, but it shines for those who don’t experience mega clogging like I do. Instead, this is more of an introductory acid toner for those who want to deep clean and tone, but quite honestly don’t need it. I used this both morning and night (with SPF in the morning!) because it was so gentle, but I really didn’t see any results. This is a long-term play for those with naturally good skin who just need to take it to the next level.